I was invited to give a talk at the OpenID Summit as a follow-up to my talk “What an RP Wants“, which I gave in February at the OpenID Design Summit. In both cases, I shared my experiences from Plaxo’s perspective as a web site that is trying to succeed at letting users sign up using accounts they already have on Google, Yahoo, and other OpenID Provider sites. This talk reviewed the progress we’ve made as a community since February, and laid out the major remaining challenges to making it a truly-successful end-to-end experience to be an OpenID Relying Party (RP). My basic message was this: we’ve made a lot of progress, but we’ve still got a lot left to do. So let’s re-double our efforts and commit ourselves once again to working together and solving these remaining problems. As much success as OpenID has had to date, its continued relevance is by no means guaranteed. But I remain optimistic because the same group of people that have brought us this far are still engaged, and none of the remaining challenges are beyond our collective ability to solve. 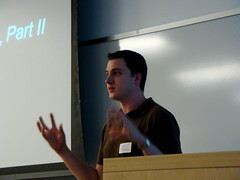 See more coverage of the OpenID Summit, including my talk, at The Real McCrea.